The perfect choice for busy pet owners, bObi Pet is specially designed to reach deep into the carpet to remove debris and pet hair. The automatic vacuum cleaner can be set to work according to your schedule, gliding across carpet, wood, and tile floors before returning to its charging station when low on energy. 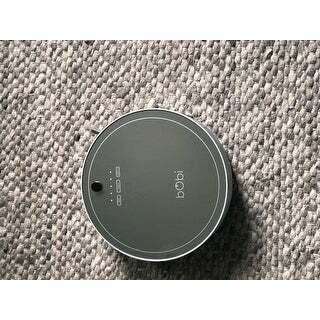 A digital barrier with bObi blOck allows you to protect sensitive furniture, while over 80 obstacle sensors and a sleek design keep this vacuum cleaner running with modern efficiency and style. I have a Dyson upright. It lost its suction... It was out of warranty, Dyson recommended buying new technology instead of repairing it. I wanted a robotic vacuum, but found so many negative reviews & they were so expensive. So I bought a Dyson canister style, thinking it would be lighter and less exhausting to use. I was still not happy, they just are not worth the money. I was spending so much time and effort to clean the floors. Really not impressed with Dyson. So, I continued to wish for a robotic vacuum. I asked for referrals, I searched the Internet for deals, I read so many reviews. I stumbled across Bobi in a top 10 list. It was not number 1, that was Neato (more than 2x the price). But Bobi was #4. The Best Buy for the money. This is the new model. The one with the block. This keeps it out of where you don't want it to go. That is included in the price with this Bobi. You also get a remote control. Yes, it's a learning curve to program your vacuum cleaner... but I'm so much happier to sit in a chair watching the cat bat at Bobi while she does the sweeping! Bobi does a great job, easily as good at sweeping both carpet and tile as either of my Dyson vacuums ever did. I had to exert zero effort, just empty the dust bucket. Bobi and I have some work to do teaching her to maneuver around the dining room table with 6 chairs, but for now I move the chairs out of the room until she is finished. And don't waste your money on the additional warranty, this one has a 2 year manufacturers warranty included! I recommend this model, and the Overstock price is excellent! I was getting frustrated in having to vacuum everyday with dogs and kids running in and out of the house. I read the reviews on other robotic vacuums and decided upon this one based on the stronger suction and ability to pick up animal hair. This item has been life changing in just the short amount of time I have had it (less than a week). I haven't even programmed it yet to start on its own, have been manually pushing the "go" button and letting it do its thing. We have wood floors with area rugs and it has had NO problems going from one to the other. I took it upstairs where we have thick carpet and it goes from the carpet to the tile in the bathrooms and back again with ease. It does get caught at the edge of the stairs as there is no "barrier" to tell it not to go strait (I just put up a baby gate and worked perfectly). The charge lasts about 2 hours which it seems to get the area done in that amount of time just fine (1500 square feet on each floor). It takes about 6 hours to fully charge so I can do one floor in the morning and then one floor in the afternoon. It has picked up animal hair, grass, food crumbs, paper clips, bobby pins, curtain edges - make sure to pick up your curtains if they pool on the ground, twist ties, pony tails, etc. All in all - WORTH EVERY PENNY!!!! I am extremely happy with my new bObi Pet Robotic Vacuum Cleaner. The wireless remote makes setting up cleaning schedules a breeze. It sweeps, vacuums and mops. A single charge will last about 1 hour and 15 minutes and it will return to the charging station when power reaches below 15 %. It also contains an easy to clean submersible dust pan. The multiple brushes add to the cleaning power while the dirt sensors alert the bObi on heavy soiled areas. The wall tracker feature allows bObi to search along the baseboards and corners. It's also great for cleaning those hard to reach places like under the beds. This machine is a real time saver when it comes to cleaning my 4200 sq ft home. Pet owners you will simply love this machine. The short review: - you aren't just investing in a great company - you're also investing in great customer service, and like many of these reviews, products do have issues, but the customer care team is the best and the product functions are amazing. Highlights: - block to set out to make sure BObi doesn't go into a place you don't want it to. - extra parts and cleaning tools so you can customize - sleek digital buttons My only disappointment with the product is the battery life but I have friends with competitors products and they have the same issue! So I chose to invest in a better product for the sleek look (I have the Scarlet red too), the greag price, and the customer service team! User history and details: I have been a Bobsweep fan and owner for 4 years! & got my first BobSweep for Christmas and he was the life of the party. We had the pet version The mopping features and the UV light were my favorite part and I really felt that it would clean effectively and quickly. I just upgraded to the Bobi Pet and I am in love. I love the clean digital buttons, and the block is great because it prevents BObi from entering into a room If I need to keep the door open. Honestly it's been the best technology investment and cleaning invest for our life mixed with no time to really sweep regularly and a dog that leaves a mess! The timer is perfect and I highly recommend. The second product even came with back up parts and screwdriver so you can take care of BObi! This is awesome! I also have to mention that in mg ownership with Bobsweep I have reached out to customer service two times and each time; they have quicky helped me resolve my problem and make sure I do so in the lost economical way possible. This is rare to find in a company and I normally don't leave these extensive reviews, but really, this product is one I'm obsessed with. You won't be disappointed. This vacuum works great on my wood floors, tile and carpet. It picks up dog hair and so easy to use! We newly received our bObi pet Robotic Vacuum Cleaner and it has been nothing short of excellence. From the easy few step set up of the robot to the outstanding customer service, bObsweep is a great investment. We’re so happy that bObi pet can join our home where our 4 German Shepherds and Husky roam and play running in and out of the house. 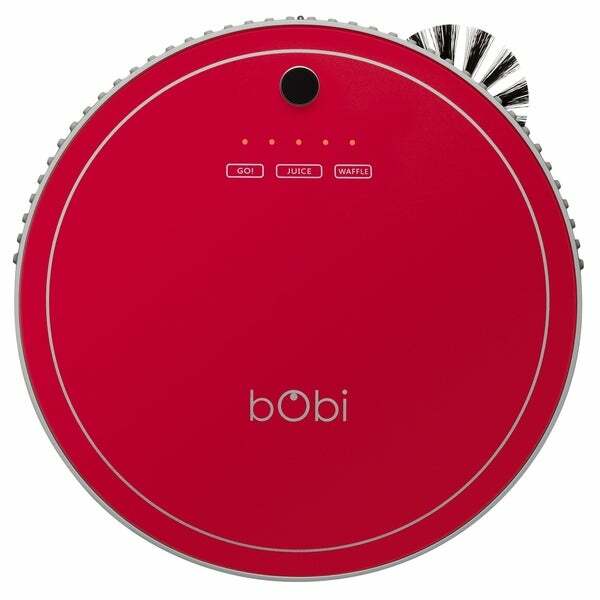 What is amazing about this bObi pet is that not only does it vacuum and mops, it also has UV light that helps sterilize as it cleans. Most importantly because we have a toddler, bObi pet has a HEPA filter to remove allergens and viruses! Having bObi is a life changer especially when you need an extra help around the house. I highly recommend bObsweep, a great company with top notch customer service. The vacuum must be synched with the base in order to return. It took about 4-5 tries to get the vacuum to acknowledge the base. I kept at it using the instructions, which said it would only take a few tries. It got up on the cushioned mats in the kitchen work areas and would not leave so I did have to block off the sensors on the bottom with the attached stickers and now it does fine. One of the dogs is a Shepherd cross with 2.5" long black hair. This will often clump and trail behind the vacuum, falling off occasionally and not making it into the vacuum canister. This happens especially after it finds a hidden clump of hair under the furniture or after he swims and his hair clumps more. This is also a very strong machine, it will push my bar stools, chairs, the elevated dog bowl holders, and other items around the floor. I try to take this into consideration before I turn it on. Where have you been all my life Bobi!!! I am beyond happy with my Bobi. She is everything I wanted a robotic vacuum cleaner to be. She is powerful, intelligent and a great help to me daily. My house has a lot of obstacles in a somewhat open room plan and she gets through it all effectively and efficiently. I also have two dogs which shed A LOT and she picks up their hair and dirt beautifully. I used to vacuum everyday to keep my floors clean, but it was very time consuming in my new house. I have a three year old that does not like the loudness of vacuum cleaners and it was always an issue. Now, Bobi cleans and my daughter doesn't mind because she is so quite. My daughter tells all of our guests.....we have a robot and her name is Bobi, we love Bobi!! I would recommend Bobi to anyone and everyone! Ic ould not be happier with Bobi! We have a mix of hardwood, area rugs, tile & carpet in our home - this quiet machine is like the HumV of vacuums. bObi gets up and over the lips of our area rugs, moves around the house, senses the stairs, cleans each floor & does it when I ask him to! I have bObi set up under my couch so he’s out of sight when charging. I am surprised at how quiet the bObi Pet is, it’s quite impressive. If you’re looking for a robot vacuum, I highly recommend the bObi Pet! It works really well as just a daily cleaner. THIS WILL NOT REPLACE YOUR REGULAR VACUUM, and no robotic vacuum will. This is helps keep up the dog hair during the week. I can honestly say my floors are much cleaner than they were before Bobi came into my life! My only issue is that she gets stuck under my couch but otherwise she really does a great job and saves me a lot of hassle cleaning up the daily "tumble weeds" of cat hair that come off of my Persian cat. I can finally walk barefoot on my wood floors. Sharing 882 first-floor sq ft of hardwood with a small and regular-sized human means I can sweep/vacuum and mop and have COATED floors with in 24 hours. And then there was bObi. Doesn't get stuck, doesn't miss stuff. Great in between cleaner. Considering replacing sofa feet with taller ones so she can get under there as well. This vacuum is okay for dealing with top soil. I did not see any difference in the things that had soil under them such as rugs. Attached carpet was okay. So many sales and so many sites to check BUT Overstock never lets me down. Their pricing is the best and their customer service is impeccable. Why buy elsewhere when you can get a prestigious company like Overstock to stand behind your purchase? Thank you for giving such great service and pricing. Not a fan of this brand. At first it did run quite well and did not make much noise. Just a short time later it just stopped working altogether and will not take a charge. I’ve had one of the original “R” brand for 6 years and it’s still going. This one didn’t last a year. Waste of my money! I love it. Such a helper. Makes cleaning so much easier and efficient. The color is fun. It can detect where my electric cords are so they don't get all tangled. It Didn’t work as described. This bObi Pet Robotic Vacuum Cleaner is a game changer. Very effective in sweeping up pet fur and dirt. I especially like the “hover” setting where it concentrates on about a 1 foot square section of flooring for a quick little pick up. We absolutely love our bObi. It does a good job keeping up with our four cats on the hardwood floors, but not so much on our carpeted area. Tends to get stuck under our kitchen mats. "What are the dimensions of this vacuum. I am trying to compare ability to get under furniture between products. Thanks." "do you have to pick up bath mats"
I've found it will go over some area rugs but try to gobble up others. I'm afraid a bath mat probably falls into the gobble category and, yes, I'd try to keep it off the floor when vac is running. "what does the 2 year warranty cover exactly"
"does it mop with a liquid cleaner"
"Does it pick up cat litter"
That was the main reason I bought mine, cat tracked all over my apartment. Yes, it will catch kitty litter; however, I still find a piece here and there. Robo vac will not entirely eliminate the need to sweep or vacuum conventionally if stepping on it bare-footed irritates you as much as it does me. "Is the vacuum new or used, it doesn't say on the description? One of the reviews said the one she got was used." The Bobi Pet that I purchased was new. Not sure that Overstock sells used items. Mine was new. I recommend the roomba irobot over this one, though. "can the docking station be used with 220?" The charging station is designed for 120V. .